PennsylvAsia: 1973 Japanese animated film Belladonna of Sadness (哀しみのベラドンナ) in Pittsburgh, July 14 - 20. 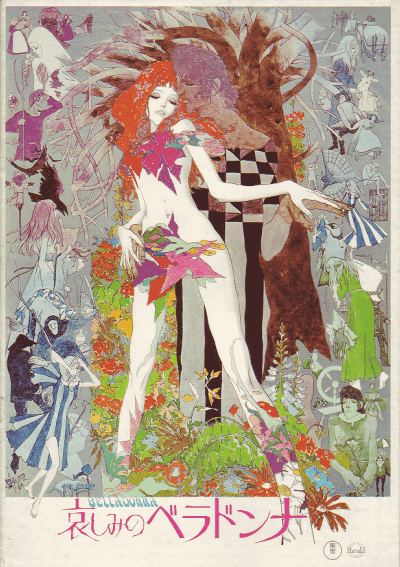 1973 Japanese animated film Belladonna of Sadness (哀しみのベラドンナ) in Pittsburgh, July 14 - 20. Beginning with a pop ballad of love, “Belladonna” tells the story of Jeanne, a beautiful young woman who falls in love with hunky Jean. The two, blessed by God, marry, with all the requisite expectations of happily-ever-after. But soon the nightmare begins. On their wedding night, the lord of the village rapes Jeanne. Jean is helpless to intervene. At first broken by the experience, Jeanne eventually vows revenge, with the help of a pact with the devil, who appears to her in explicitly phallic form and grows larger the more Jeanne submits to him. As Jeanne grows more and more powerful, she poses a threat to both the village lord and its priest, who seems to always be beside him. Jean seems progressively more wimpy, succumbing to drink and excess. The men grow weaker as she grows stronger, until she becomes a powerful witch and must be taken down. But that becomes difficult, because the peasant villagers have become attached to her—she provides them healing and hosts nights of unimaginable pleasure in the forest. Violence is the only recompense. The film will play in Japanese with English subtitles at the Harris Theater for the week and at the Melwood Screening Room in Oakland on the 16th; showtimes are available online. The first screening is on the 14th at 5:30 pm. The Harris Theater is located at 809 Liberty Ave. in the downtown Pittsburgh Cultural District (map), and the Melwood Screening Room is located at 477 Melwood Ave. in Oakland (map).